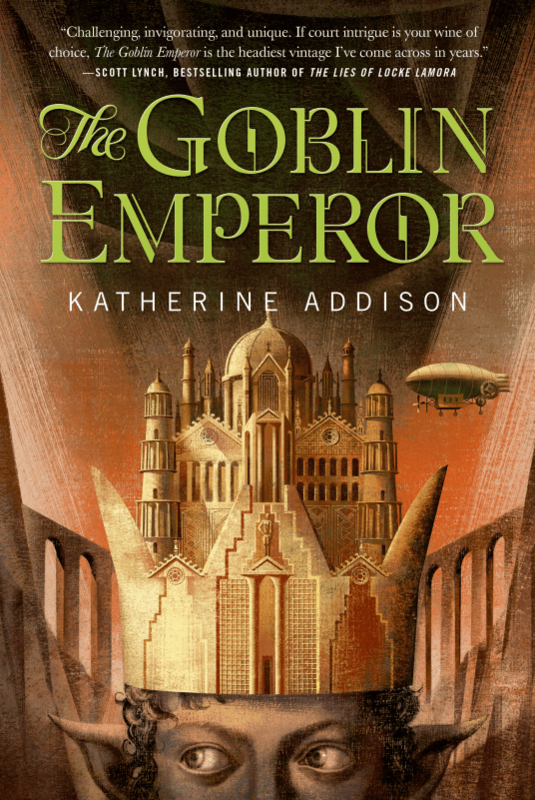 Why did we read this book: We have heard nothing but rave reviews for The Goblin Emperor from many trusted sources, which of course meant we had to give the book a read. That, plus the gorgeous cover and courtly intrigue plot. Oh, and did we mention that the author, Katherine Addison, is a pseudonym for Sarah Monette whose novel Melusine we both reviewed positively. The Goblin Emperor is the remedy to soothe ailing souls. It follows the story of Maia, the youngest, half-goblin son of the Emperor who has lived his entire life ostracized, uneducated, hidden away in a small state under the tutelage of an abusive, disdainful cousin. When his father as well as his three sons (and heirs in line for the throne) are killed in an accident, Maia, as the only surviving heir, becomes Emperor. Completely ignorant about everything concerning his kingdom – politics, economics, social mores – Maia is thrown into a situation he can’t control with nothing but a few advisors willing to help him navigate the dangerous waters of court intrigue and politics. In between learning the intricacies of his government, Maia has to deal with petty jealousy, conspiracies, diplomatic fall-outs, and a plethora of close and distant relatives currying favour. He also needs to find a wife and deal with the fact that he cannot have real friends (for the Emperor does not have friends). If that was not enough, he comes to learn that the accident that killed his father and brothers was no accident at all and that they might be coming for him next. The Goblin Emperor is that type of Fantasy that is quiet and reflective, much more concerned with the intricacies of court intrigue and political shenanigans than it is with grand gestures of magic, big explosions or loud fighting sequences. This is not to say that the book doesn’t contain Big Moments – quite the contrary. It’s just that those are almost always subtle and restrained. At face value, it’s an exploration of Maia’s limitations as Emperor and his ongoing struggle to understand, learn the rules of his position. There is a lot of irony in learning that as Emperor, he might have limitless power and is both respected and feared by most people but that in effect, he has little say regarding what he can or cannot do: he is forever bound by rules, always under guard, his privacy is non-existent. But going back to the point that Maia is learning. That means, that Maia is, in many ways, a mirror to reflect the reader. It’s through his unschooled, ignorant eyes that we too, come to understand the intricacies of this world. From the way that language is used (especially the way that people address each other) to the way that people dress, no stone goes unturned. That this is done with very little info-dump is testament to the author’s ability to build her world flawlessly. The best part though? The best part are the little, micro details that make-up that world and which mean so much in the great scheme of things. Because this is also a story of privilege, of underdogs and outcasts, of poverty and injustice and corruption. There is the unspoken racism and prejudice surrounding the Goblins in a court of Elves. There are the limitations imposed on women, based on their gender. There are the class differences between the poor and the rich, those who inhabit the realm of power and have voices, versus those whose voices are barely heard. Many of Maia’s actions in the book are about how to break free of those limitations by using the tools and the power at his disposal. As an outsider himself, Maia is a person with an almost limitless sense of compassion and understanding which is a thing of beauty to witness in a character. I’ve grown so used to anti-heroes and “dark” characters that it was a breath of fresh air to spend time with a character like Maia, who is so…earnest. And nice. I loved Maia and spent most of the book yearning and hoping that he’d find the friends he so craved. This book reminded me of works from favourite authors like Diana Wynne Jones and Terry Pratchett, but I thought a lot about The Queen’s Thief series by Megan Whalen Turner when reading The Goblin Emperor. Not because of any comparison between characters, for Eugenides is as self-confident as Maia is not (at least to start with), but for the intricate politics and diplomacy of its affairs. And to be honest, inasmuch as I loved all of the quiet diplomacy, my heart went pitter-patter when Maia’s fiancée Ceredin was all fierce and protective and ready to gut his enemies with her sword, which fills my heart with hope that theirs could be an awesome marriage. What can I say? I am a romantic. The Goblin Emperor is smart and delightful. I’d be surprised if it didn’t make my top 10 this year. The Goblin Emperor is a brilliantly hopeful book. The story of the unlikeliest of heirs ascending to the Imperial throne and navigating the treacherous waters of the Untheileneise Court, The Goblin Emperor is a surprisingly quiet – and, as Ana says, refreshing – fantasy novel. This is not a book about the rising forces of Darkness and Evil threatening all that is good in the world, nor is it an action-packed tome filled with exploding airships, violent courtly machinations and backstabbing bloody vengeance (and make no mistake, The Goblin Emperor easily could have been that book). No, this is an unexpectedly introspective novel. Though it’s told on an imperial scale (in that the heart and soul of the novel is the new sovereign), in sooth The Goblin Emperor is the tale of a young ruler’s coming of age, consolidation of power, and ascendance as the best possible leader for his people. Just like its eponymous hero, The Goblin Emperor succeeds because it is relentlessly optimistic and stubbornly endearing – even in the face of daunting skepticism and adversity. So let’s talk about characters, because I loved, Loved, LOVED protagonist and young emperor Maia. The son of the late Emperor and his despised late Goblin wife (who dared become pregnant after the first and only time she had relations with her husband), Maia has been exiled to a remote and impoverished corner of the realm, without opportunity, education, or any hope of a future. With only his drunken and abusive elder cousin Setheris for company, Maia’s young life is bleak in the extreme. Knowing this troubled and painful past, Maia is so compelling as a character because when he is given the news that his father and half-brothers have all perished and thus Maia is the new rightful Emperor, he is neither cruel nor vengeful. He is naive, certainly, and utterly unprepared for ruling an empire, yet he rises to every challenge thrown in his path. More than merely resilient, Maia is compassionate and just – he decides immediately that he does not want to continue his father’s legacy of fear, but would rather rule peacefully, even assuming a different Imperial name and seal. Just as much as I love the endearing Maia, I also loved the fraught relationships that characterize this book. The relationship between Maia and his cousin Setheris (who raised Maia, following the death of Maia’s mother) is of particular import. Even though he has suffered at Setheris’ hand – years of emotional and even physical abuse – and rightly wants nothing further to do with his cousin once he becomes Emperor, I find it fascinating that Setheris’ voice is always in Maia’s mind… and helps goad Maia into standing up for himself when threatened. Theirs is a tangled relationship of duty and family and resentment and fear, and in my opinion one of the most interesting dynamics of the book. (For all that Setheris isn’t always present, his voice echoes with Maia’s every thought, insecurity, and decision.) And that’s just one of the relationships that forms the fabric of this novel – there’s also the brotherly relationship between Maia and his successor, the child Idra (who is more than just a pawn in his scheming mother’s plans), and the not-quite-friendship, but more than master-servant relationship between Maia and his retinue of guards and administrators. These are equally well-defined and wonderful to read. The only relationship I wish we had more time to explore, however, is that between Maia and his betrothed, Ceredin. While I love the glimmers we see of her – and her cool defiance – like many other female characters in the book, I wish we had a little more time with Ceredin. That’s not to say that the book is lacking in female characters in any way – quite the contrary. While the role of women is limited in the traditional courtly sense (i.e. they are wives or mothers, to be bartered and used in marriage agreements for power), Addison introduces readers to female characters who yearn for more and challenge the norms of this society. Maia’s half-sister, for example, desires to study the stars, while his betrothed knows the forgotten Elvish art of dueling (and implies that she isn’t afraid to use that skill). Still others hold skilled professions, including engineers, bodyguards, and performers. Along this same vein, I quickly want to reaffirm Ana’s observation that there is discussion of the clear prejudices in the court – towards women and their traditional roles, towards the darker-skinned Goblins who are seen as lesser to the paler Elves, towards the relationship between male lovers, and towards those who choose the path of “mysticism” and superstition over Elvish reason. All of this, and more, is very nicely explored in The Goblin Emperor. While there are many wonderful things about The Goblin Emperor, I should also mention a few key criticisms. As a character, Maia is almost too good to be true – he’s naïve, yes, but he’s also patient and kind and cares about what everyone else thinks. More than that, he’s incredibly lucky to be surrounded by (mostly) trustworthy advisers (his secretary Csevet is a huge asset to his success as a ruler). Also, on the opposite side of the same coin, I’m slightly disappointed that the bad guy in this book is not just ambitious and hungry for fortune and power. This particular character is painted as abusive and cruel in his treatment of others (especially someone very close to Maia at court) – and while this isn’t a huge part of the story, but it makes simplistic and didactic a book that is otherwise about conflicted motivations and shades of gray. And then, there’s the real central issue to the text – that of optimism. Allow me to elaborate. The Untheileneise Court is a complex ecosystem, but simultaneously one that is hard to understand initially because we readers are viewing this story through Maia’s unseeing eyes. That’s not to say that Maia is slow or willfully ignorant; his incomprehension stems from the fact that he grew up without ever being exposed to the Untheileneise’s subtleties and machinations. Like Maia, readers can sense that there is much going on beneath the shimmering veneer of civility and placidity that defines the imperial court; but also like Maia, we are working with limited information and cannot grasp the entirety of the sharp, deadly things that lurk beneath the smooth surface. As the book progresses, though, and as Maia’s understanding and self-assuredness grows, these incomprehensible shadows begin to take shape. To me, the intrigue in The Goblin Emperor has more in common with the complex machinations of, say, Jaqueline Carey’s Kushiel novels or the books in Martin’s A Song of Ice and Fire than Megan Whalen Turner. But the comparison I kept making in my mind while reading The Goblin Emperor was to Lian Hearn’s Tales of the Otori series, which is like… a malevolent twin to this Goblin Emperor tale. In the Otori books, peace is ever-elusive and cannot be attained nor maintained without necessary violence; in The Goblin Emperor, however, there is actually no violence “on screen” (though there are reflections of violent acts in the past and in threats). Maia’s governance is compassionate from the second he ascends to the the throne, and he rules by asking those around him what they truly desire and tries to grant those wishes. That is to say: Maia’s rule, his ascension to power and his maintenance of that power is utterly, perhaps hopelessly, idealistic. Readers may choose to believe in The Goblin King‘s optimistic message, or to discredit it. I, for one, choose to believe in it (though I would not fault anyone for discrediting the vein of pure idealism that runs throughout this book). Regardless of whether or not you believe in The Goblin King‘s optimism, I will say that adult fantasy could use a little more optimism and idealism on the whole. Don’t you agree? In this sense, the impossible bridge that Maia builds to define his reign as Emperor Edrehasivar VII is the perfect metaphor for The Goblin Emperor as a novel: a seemingly impossible feat that succeeds because of its ingenuity and optimism. Suffice it to say that I loved this book very much, and I wholeheartedly recommend it to readers of every age and genre. Thea: 8 – Excellent and leaning towards a 9; and in the running for my top 10 of the year as well. Just one more book that I have and really need to find time to read! Just finished it yesterday, and LOVED it. I agree that Maia was almost too perfect, and I read it on my Kindle, which makes flopping to a glossary or index pretty dificult, so I didn’t even have that advantage when trying to figure out which alphabetically-endowed character I was reading about at that moment. But by the end I had finally got the hang of the characters, and sometimes it’s good to have a perfect person to admire. Gave me a “book hangover” and left me with yens towards so many other books. What I have settled on is Elizabeth Wein’s Sunbird series. Started it years ago and never got past the first Telemakos story, even though I really liked it. Great review! You’ve really sold me on this one. Just wondering, is this a YA or MG book? I would guess YA from your review (with the emphasis on political intrigue, etc.) but something about the cover feels a little more juvenile to me. I enjoy both YA and MG novels, so I’ll probably read it either way, but I was just curious. @Melissa – neither. This is an adult book, just not ‘adult.’. Intelligent and hopefull rather than gritty/crude. Oh OK thanks! The cover reads a little younger to me, which I think is what threw me off. Thanks for clarifying. I just finished reading this book a couple of days ago, it’s definitely a different one, at least by fantasy standards. I find myself feeling pretty similar to what Thea felt about it, especially the secondary characters and their lack of page time and development. Overall it was refreshing to read a hope inspiring fantasy book, and Maia was an enjoyable narrator. Just finished reading this, and I felt I was reading some strange pollyannaish rewriting of “I, Claudius”, where the authors’ joke was the readers gradual increasing revulsion for the absolute power and tyranny of the emperor. Addison/Monette plays this strange game, of painting a society with ideals of social, sexual and racial equality roughly contemporaneous with the current US views, so that we feel comforted and familiar in it, but then gives us a dictatorial narrator with absolute power — and one who is genuinely decent, even as our revulsion for his power grows. Its relationship with Graves reminded me of that old parody of Philip Larkin “They tuck you in, your mum and dad // and read you Peter Rabbit too // They give you all the toys they had // and add some extra just for you”. I am still strikingly puzzled by Addison’s intent — and creeped out by the strange mismatch of the personal and the political (most beautifully evident in the justification for the bomb that propelled Maia to the throne, a justification that (incidentally?) made absolutely no sense without the bomb maker being able to predict the future ). Addison is an ably competent writer — no literary novelist, and no writer of thrillers (the pacing lacks a certain forward momentum, but the book is sufficiently compelling I read it with pleasure in one sitting), so I presume the effect she got was what she was after. I just don’t understand it. Dear Anon — because of the Katherine Addison post yesterday, I was looking back through the archives — may I tell you that your analysis is brilliant? I also was disturbed by the tension that you describe, although I enjoyed the book immensely and respect many of the things it seems to be trying to do. I thought it was an inevitable result of the collision of a very traditional personality-driven monarchy fantasy (signaled, in part, by the frank adaptation of Tolkien-esque Elves, and even an 19th or 18th century fairy-tale aesthetic in some places) and the attempt to incorporate nods to post-industrial political radicalism, under which paradigm the goodness of the individual is irrelevant to the injustice of the system. I do think that this tended to undercut the optimism and hopefulness around Maia’s reign, but I’m not sure that this was intentional.